Sweaters I bought this year – at typical Canadian retailers: The Bay, Sears, Wal-Mart, Reitman’s and Northern Reflections! 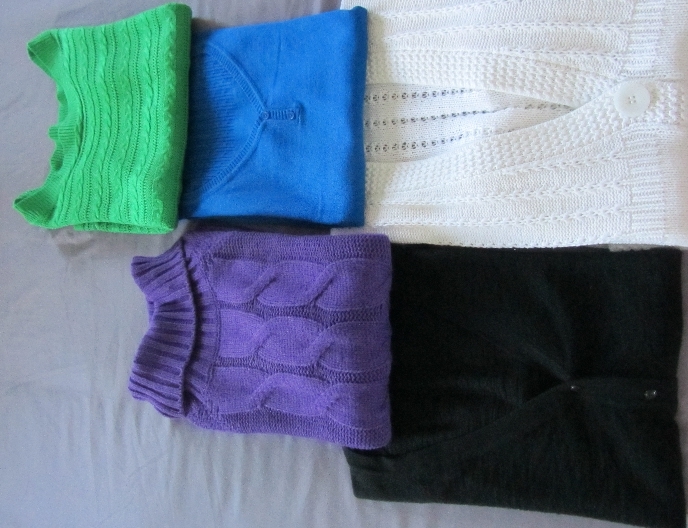 On January 1, 2012, I began a new clothing inventory project. I had 480 items of clothing, if you count every single scarf and pair of socks! I said that 264 of them were “substantial” items of clothing. By April 30 of this year, I had finished my wardrobe pare-down, and reduced the number to 170 items. Since then, I have been trying to buy thoughtfully, with varying results, as you saw in yesterday’s post! I’m pleased that with all my buying this year, I haven’t increased the size of my wardrobe. I suppose my next goal will be to get down to 150 items, which I should be able to do this year through “attrition” – items will wear out and not be replaced. I am enjoying having a smaller wardrobe. It’s easy to see at a glance, I can find things instantly, and with less clutter, I am more tempted to try out different combinations. The best thing, though, is knowing that every single item is in good condition and actually fits me – not last year or next year, but now! Thereby doubling my wardrobe count 🙂 So my “Total Total” of all items, big and small, is now 326. If you’ve been trying to “right-size” your wardrobe, are you happy with your progress? What are your next steps? I am very aware of how fortunate I am to spend this much money on clothes. I have had tough times as well when I wasn’t able to buy anything. I try not to over-compensate! Strangely fascinating topic! But 40 pairs of socks?!! I always have about 14, enough for a fortnight’s holiday, plus 2 pairs of thick walking socks. Perhaps you need more in Canada or go for longer holidays? LOL, you are very generous in thinking I must have a good reason for the socks – I don’t! I have 14 pairs suitable for work and 10 pairs suitable for walking/gym/weekends. The rest all have silly prints like tea cups or frogs on them, and I mostly receive them as Christmas gifts from my mom and mom-in-law! I could tell them to stop but I like them and it’s a fairly harmless collection! I pared my wardrobe right down this year- it almost entirely consists of leggings and dresses! However, when I got a new job I realised that I needed some new clothes- so I have added two dresses and new leggings to the collection. I’ll try and do a clothes count in the next few days- I wrote this http://bettybeesblog.blogspot.co.uk/2012/11/20-80-of-time-or-how-many-clothes-do-i.html last year, so it will be interesting to see what has changed! Thanks for linking to your post! I like your dresses – can you wear them at your new job? I’ll look forward to your update! Ha ha! We would have to do a sock trade and I would send you socks with beavers or moose on them! haha, your sock collection comments make me want to count my socks to see how many pairs are actually work appropriate vs. the smiling pumpkin and dancing bear type socks that I get for Christmas and my birthday. My wardrobe could probably use a few more items (like I’ve been considering buying a pair of tights for a few months now) but clothes shopping is just not that exciting to me and I usually put it off as long as possible. I can’t imagine giving, or getting, funny socks as a gift for Christmas! Good counting Dar. I lost count with my tops. May have another try. So with all those tops, you won’t do patterns? I realized I have a lot of striped tops, one plaid, and one patterned. I took a closer look and I have 2 patterned hoodies, skinny jeans with a paisley print, and my “snakeskin print” coat. And of course my large T-shirt collection all have pictures on them like Hello Kitty. Does that count? I had a big clean out in July and now can’t find a pair of jeans I really like, oops! Well done on paring down your wardrobe, it feels good doesn’t it? Definitely counts. And the snakeskin print coat sounds very striking. And isn’t it funny how we think we don’t wear/do certain things, and then find we actually do. Wow you are soooo organized! Since I havent been working in ages my wardrobe consists of: jeans, t shirts. That’s all! I look forward to that someday! I’m thinning down my 45 pairs of knickers, cause I know I have so many, and when they don’t sit ‘well’ they get tossed, as with bras that continue to slip off my shoulder due to lack of elastic. I had too many socks too, so I took some out of circulation. Thankfully they are mainly all plain black for work, or white for running. I have way too many pairs of tights, but I am loathed to thin the collection, as in cold climates I need pairs for every day (this would be when I travel). I should do a recount too – I have more dresses year on year, thanks to getting back to regular church visits which means I know I will wear them regularly. I will also get to collating all my receipts for purchases tomorrow, and reflect on that. I look forward to your update. I might replace all my underthings in the new year! It’s all drafted, i just need some photos… A beach trip yesterday meant I wasn’t as ‘bloggy’ as usual. What an interesting project. Since I have three closets full of clothes, I can’t even imagine counting everything. I think I must fall into the hoarder category. Hmm, it depends – Do you wear them? Can you find things? I can’t imagine keeping 3 closets of clothes any more, but I think I once did…before one household move, I gave away 17 garbage bags of clothes! This has really got me thinking! I have absolutely no idea how many items of any type of clothing I have – clearly more than four (as that is what I am currently wearing) but not very many more, I’d think, based on my inability to find anything to wear for most occasions! I’d probably be surprised though! A stocktake might be in order.. The whole process has been 2 years now…quite a long time! Now that I’ve been through the seasons a couple of times, I’m getting better at remembering what I really like to wear (and not what I think I will wear ‘someday”)! If you are around 100, that’s great!